There are not as many spaces in the C-U dedicated primarily to showing the visual arts as I could hope. But, out of the few we have, there are two which are very special and, of which, we are lucky to have. Krannert Art Museum (which proudly states on their website that they are the second largest general fine art museum in Illinois) and the Donna Hyland Giertz Gallery teaching gallery at Parkland College are the two to which I am referring, and when reaching out to learn more about Giertz Gallery Art Director Lisa Costello, it came as no surprise to me to learn she has been involved with both spaces and, of course, shares my enthusiasm. Hear more about the complicated, but exciting, role as an art director and Lisa's journey to and through it. Smile Politely: How long have you been the director of the Giertz Gallery and what were you doing before you became the director? Lisa Costello: I became the director of Giertz Gallery in the fall of 2004. I worked at Krannert Art Museum before I started working at Parkland College. I started out as a preparator and then became the exhibitions coordinator. I was also the exhibitions curator for a few of the MFA shows. I really enjoy working with students, and it was at KAM that I realized I loved working with contemporary artists, being in an educational environment, and helping students. 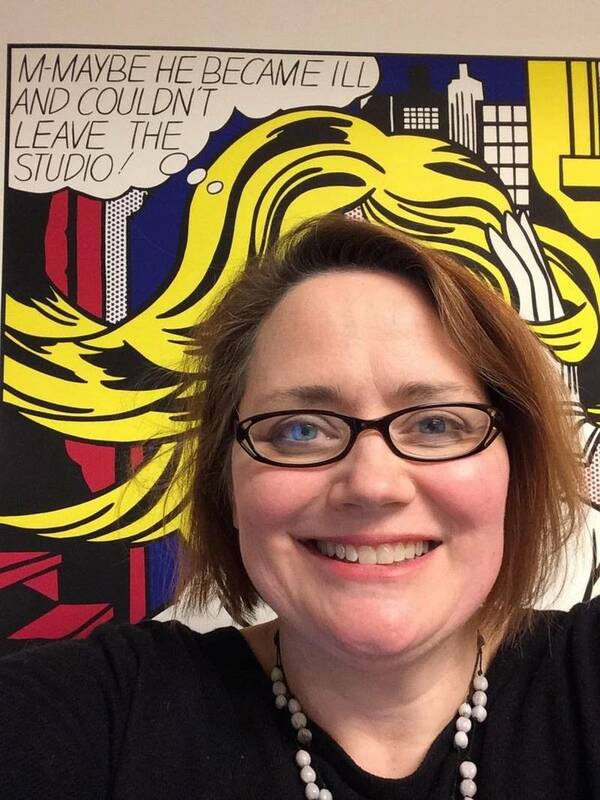 Lisa Costello in front of her favorite Roy Lichtenstein painting. SP: How would you describe a dream day at your job? What are your favorite random happenings and revelatory moments? LC: I experience things in ways that seem more like fleeting moments that are really satisfying rather than a dream day. We have seven exhibitions a year, so the work never stops. There is always a show coming up and deadlines to meet. I have a pretty extensive to-do list, and I like the challenge. I like the feeling of pulling a lot of things together, from unpacking the work, to figuring out the best way to install it, to tweaking the lighting, to working with the artists, to sending out the news release, and having an exhibit as the result. It is pretty rewarding but the success comes in increments rather than a single day. Some of the more revelatory moments include giving tours of the exhibitions and working with the students. We have classes come from all over campus and the community. We have the boy scouts and girl scouts come to learn about art, and some senior groups too. Of course, the art and art history classes visit the gallery, but we also have Liberal Arts, Humanities, various English classes, English as a Second Language, among others. I love to hear their feedback about the exhibit and what they take away from the artwork. It is always rewarding to meet someone who is nervous about having to do an assignment. Then they really respond to the work, and it becomes a positive experience for them. Many times, someone has an observation about the work that makes me reexamine my thoughts, and that is a particularly positive feeling. Some of the other highlights would be when we have an artist speaking in the gallery or doing a workshop with our students and everything goes really well. The students have a positive experience and learn something new, and the artist is really happy with how the audience reacts. Artists put so much into their work, and it is good when they get that experience. Making art in a studio can be a solitary experience, so that interaction for both sides can be pretty magical. SP: In contrast to the last question, and in relation to your job, what would be your equivalent to a “I went to school and forgot to put on my pants” nightmare? LC: Not being able to predict the weather is what gives me nightmares! For gallery events we plan a year out, sometimes more. The Illinois weather can really put a damper on well-laid out plans if it wants to. I have learned to just roll with it, but you never know if there is going to be a pop-up snow storm, torrential rain, or threat of a tornado. We have only had a few really odd episodes, like a snow storm during a fundraiser, or a hail storm before an opening. I’ve learned to just hope for the best and stay positive. SP: When did you decide to pursue being a gallery director? Do you have other interests that compliment your role as a director or perhaps, led you towards the position? When I was little I made this elaborate hutch with an interior house for my guinea pig. I loved him, and I built a hutch so he could hang out in the summer in the backyard, eat grass, and retreat into his palace. My parents took note and realized that I liked to build and plan things. They were always very supportive of my interests. I thought I wanted to be an architect for a long time and that got me interested in materials – technical pens, vellum, markers, and model making. I eventually ended up at UIUC in art and majored in Metalsmithing. I loved it. I also loved art history. I took so many classes and changed my major so many times that I accidentally had enough credits in art history to get a second degree! I was also lucky enough to get an internship at KAM and then work there in the exhibitions department. I went to Cranbrook Academy of Art and while getting my MFA I worked at the Cranbrook Art Museum. It seems like I’ve always been working in museums. I like the planning and designing of exhibits. I think I am a good fit for my position. 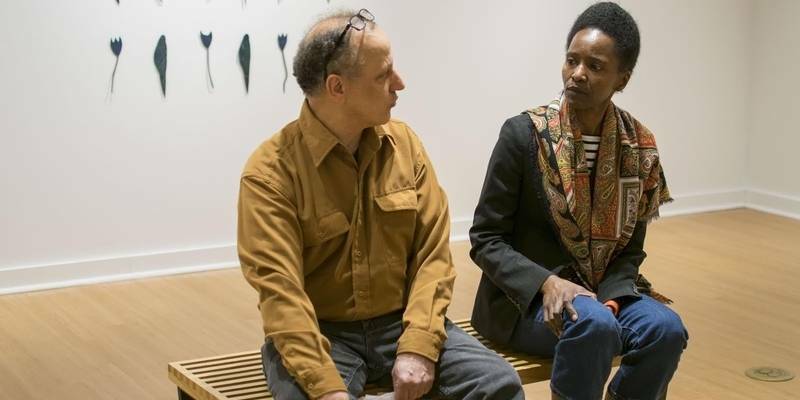 Professor of art Chris Berti speaks with artist Alicia Henry (who had a solo show in the gallery last year). SP: What do you consider to be the most innovative thing you have done since you have been director? LC: I feel the role of the gallery director is really to provide a platform for innovation to take place and for people to experience art. I want the gallery to be a welcoming space that includes artwork that has many access points for our students and visitors. Whenever we put together exhibits, this is a main goal for us as a teaching gallery. Our programming and exhibitions need to meet the needs of our constituents, and as a community college we cast a wide net. We have people from so many backgrounds and experiences. They come to Parkland for a variety of reasons. I hope that the gallery can serve as a place for everyone to come and experience art. We really try and have the best possible exhibits that meet these needs, so I don’t see myself as particularly innovative, except for trying to think strategically to get things done and maintain a certain level of quality and engagement. However, I have to say we are successful in our programming. An example would be our Art Expeditions. These day trips to nearby venues, came out of both a need and a desire to raise money for the gallery and stay committed to engaging people with the arts. Over the years we have gained a following of people who have a sense of adventure and like to go on our trips to see art and architecture. Champaign-Urbana is great because it is located between Chicago, Indy, and St Louis. So, we have the best of both worlds. We collaborate with Parkland’s Community Education program to provide these trips, and we are enabled to see so many exhibitions and visit architectural sites that might be prohibitive without going as a group. Another thing that we have been working on is the care and conservation of our student collection. Many people don’t know this but we have over 350 artworks that have been purchased from our Art and Design Student exhibition. This collecting of artwork has been taking place since the inception of the art program. There have been so many advances in the care and conservation of artwork over the years that I felt it was our obligation to preserve the works. These works are installed all over campus in new standardized frames with archival mats and UV plexiglass. Recently they have all been digitally documented, thanks to funding provided by one of our donors, so that we can preserve the life of these works that are part of the history of Parkland. This is a constant work in progress but it is great to see the works out and being used as an educational resource all over campus. I’m really proud of my staff, including our High School Art Interns and former student workers. I try and have a good team environment and it is great to see when they leave and go on to something that they want to pursue. 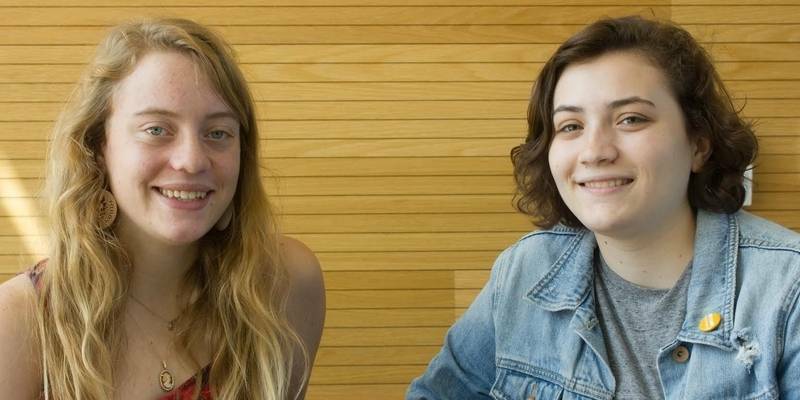 I am quite proud of their successes in what they are doing after working at Giertz Gallery. I know I was supported when I was a student, and I try to provide a healthy environment for our staff. Giertz Gallery interns Sage (left) and Joanie (right). SP: The gallery is very connected to the Parkland College student body and supportive of local and regional artists. What do you consider to be the biggest advantages of the interconnectivity between the gallery, the college, and the community? LC: I am happy that the Giertz Gallery is a valued part of the community and that we are able to support local and regional artists as well as bring art to our community. We really strive to provide exposure to various forms of artwork and to engage a wide variety of people. It is our mission to be able to provide opportunities for people to exhibit their work but we also provide an opportunity for people to experience art in a more intimate venue to hear what artists are thinking about while making their work, and how they approach their artmaking. I think it is really fortunate that the community and Parkland College have been so supportive of having a gallery on campus and that we bring people together. I think it is great for all involved. The arts community is also really a great support network. I can’t tell you how many visiting artists I have brought to campus, and they have always been impressed with the number of people that show up to our events and also to how many great things are happening here in our area. But it is not only all of the people that come to go to events and exhibit their work, it is all of the other organizations that exist in the area. If you are interested in the arts, there are a lot of places to engage and learn and I think all of us work together to make a nice hub of creativity happen. I am happy that Giertz Gallery can be a part of that activity. I was on the board for 40 North: Champaign County Arts Council, and it is so terrific to see so many people and organizations support the arts in our community. I have met so many people who work behind the scenes to make all of these things happen. If you have any doubt, go to one of the ACE Awards events that 40 North hosts. That is a great opportunity to see our community shine! (Find more information here). SP: Do you have a favorite place in C-U, other than the Giertz Gallery, to go see art? How about regionally? LC: There are so many great places to visit and experience art in Champaign-Urbana. Not just the visual arts, but also music, film, dance. It depends on my mood, the time of year, and what is happening around town. I love to sneak into museums and galleries when no one is around. I can really appreciate the work that way. I find that hard to do at openings and big events because I end up visiting with people. I’d have to say that my favorite place to go in CU over the years is the Art Theater. The experience of the lights going down, the upcoming trailers, the big screen, the reaction of the audience, is all part of the movie-going experience that I love. I love films that either take me someplace I have never been or experience something that I have never felt. I think the movies cannot only serve as an escape, but also make you a more compassionate and informed person. Documentaries, old films, international films, really bad action movies. It’s all good. I also love popcorn. They have the best popcorn in town. Regionally, I love the Museum of Contemporary Art in Chicago. I try and see every show that I am able to when I’m in Chicago. I love contemporary art and I see it as part of my job to continue to learn about the field. I’ve seen some great exhibits there like Doris Salcedo,Takashi Murakami, the infamous Jeff Koons, and most recently Otobong Nkanga. Another place that is always on my radar is Intuit, the Center for Intuitive and Outsider Art. I love folk and self-taught art. The need to create art and express oneself is really evident and I find that it is a grounding experience to see the work first hand. SP: What is happening this year at the gallery that you are most excited about? LC: Our calendar is chock full of great things this year. We have a terrific line up of exhibits. Right now, we are in the midst of our summer High School Art Internship and our interns are helping with upcoming events for the year. It is nice to see their reaction to what we do behind the scenes in preparation for the upcoming season. This fall, in addition to our annual Art and Design Faculty exhibition that kicks off the season in August, we will also have a solo exhibit of a Michigan painter, Teresa Dunn, entitled “Cover the Waterfront”. This is going to be a very engaging exhibit with large round paintings that serve as an island-like stage for her dramatic storylines. I look forward to hearing her speak about her work when she comes to town. Then we will have a photography invitational, curated by Christopher Schneberger, a photographer and curator who teaches at Columbia College. This exhibit features at least six artists who have devoted their work to highlight the idea of “place” and location. In the spring we will have work by Connecticut artist Leeah Joo. Her exhibit is called “Draped and Bundled”. Her work explores drapery as various metaphors of her experience as a Korean-American immigrant. The detail and connections of her subject matter are personal and universal at the same time. We will also have our two student exhibitions at the end of the spring semester. They are always a favorite for our visitors. Next summer I am delighted to be able to have a solo exhibition of Don Lake’s work. This will include pieces that reflect his career as a watercolorist over the past 30+ years while teaching at Parkland College. So that, coupled with all of our Art Expeditions, should have something for everyone. M-Th 10 a.m. to 7 p.m.